Joan has been with Court Square Title since October 2002 at the height of the boom refinance market. Although Joan wasn’t born here, she was raised in the area and is a graduate of Albemarle High School and VPI & SU with a BS in Business Administration. 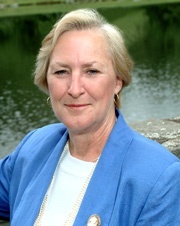 Her ties to real estate go back many years though her Mother, Edith Grinde, who spent over 15 years with Montague, Miller & Co; and her sister, Barbara McMurry, who is currently with Montague Miller & Co. Joan lives in Fluvanna and enjoys spending time with her daughter Paige, son Matthew, and grandchildren Annabelle, Sanai, Brian and Princeton. Leisure activities include serious porching, and family get-aways.